The Adult Transition Program (ATP) is part of Fresno Unified School Districts Special Education Department. ATP provides functional life skills training to students who are eligible for special education services with moderate/severe disabilities. This program is designed with emphasis on life skills, so the students can reach their full potential as independently as possible at home, in school, in the community and in vocational settings. UC CalFresh Nutrition Educators Sandra Ortega and Yolanda Lopez are delivering nutrition education from the "Eat Fit" curriculum to the students of ATP. The interactive lessons have the classes learning, dancing and having a great time! The students of ATP have learned the importance of physical activity and do not let physical limitations keep them from working hard to be physically fit! 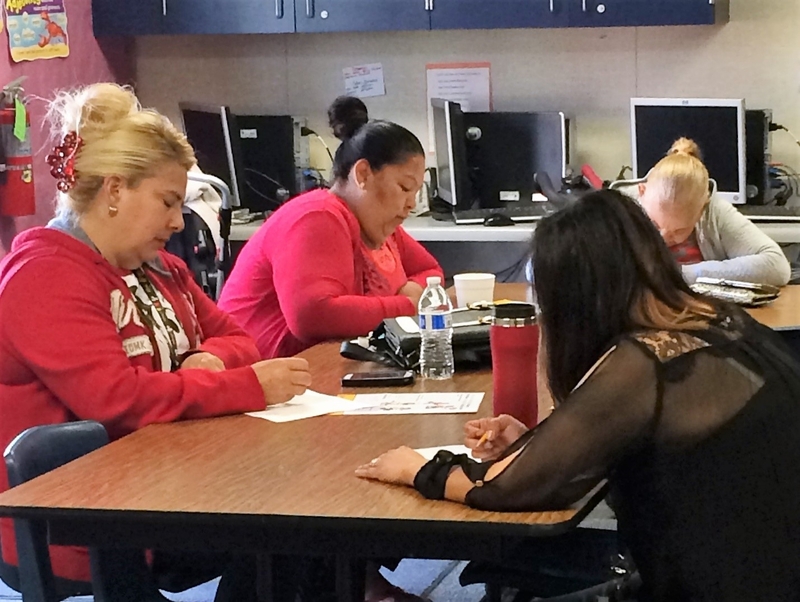 Stay tuned for more updates on these awesome students and dedicated teachers! Do you know your BMI? BMI stands for Body Mass Index and is a measurement comparing a person's height and weight. Although it is not a measurement of body fat, your BMI can give you an insight to your weight status and indicate if you need to make a change. An individual with a BMI that falls into the overweight or obese category has an increased risk of heart disease, high blood pressure, high cholesterol, type-2 diabetes and some forms of cancer. 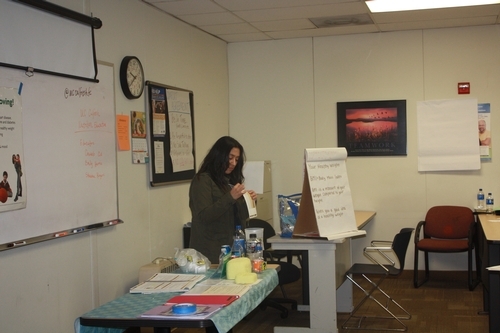 At a recent no cost adult nutrition class, Nutrition Educator Consuelo Cid taught her participants about BMI and encouraged them to use it as a catalyst for healthy lifestyle changes. 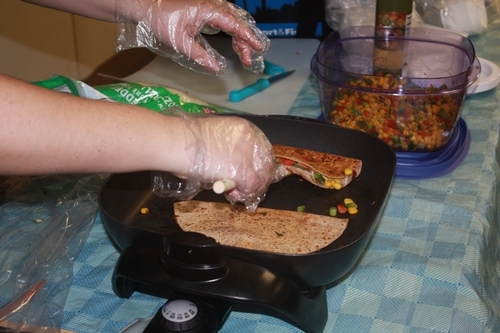 Vegetable Quesadillas were served to show participants a nutritious way to enjoy a favorite food. 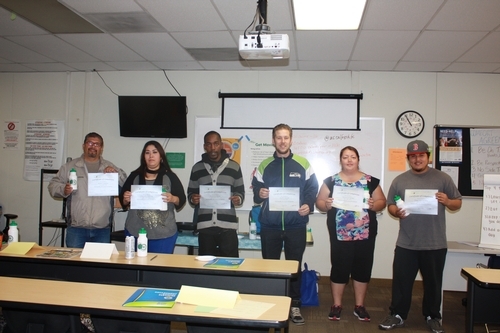 Six graduates at Jobs and Beyond smiled for the camera with their certificates from UC CalFresh. Their water bottles, courtesy of UC CalFresh, served as a tool to encourage them to drink water and skip sugary beverages. If you are interested in finding out your BMI, click here. UC CalFresh Fresno County has a long standing partnership with the Fresno State Dietetic Internship Program. This blog post is part of our Intern Reflections Series. 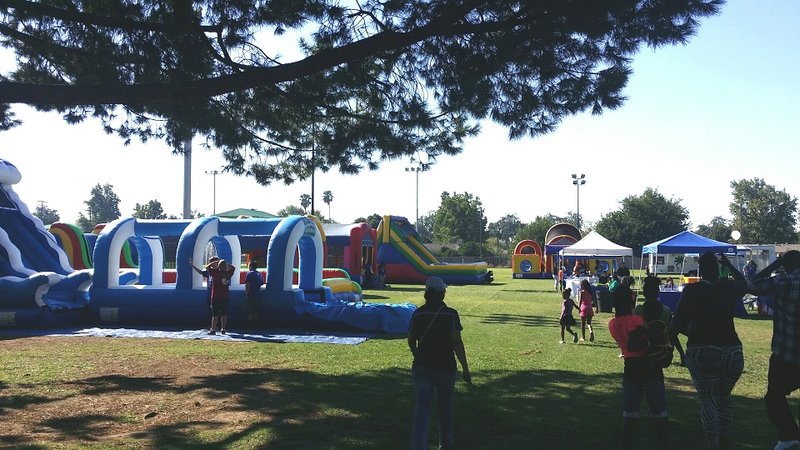 The Carnaval Children's Festival, held at the Mosqueda Community Center on September 19th, offered family fun and entertainment with bounce houses, wildlife exhibits, and swimming pool games. Families visited colorful booths that offered a wealth of information about their community and a handful of freebies. Children enjoyed getting physically active in the bounce houses! So many great vendor booths to visit! 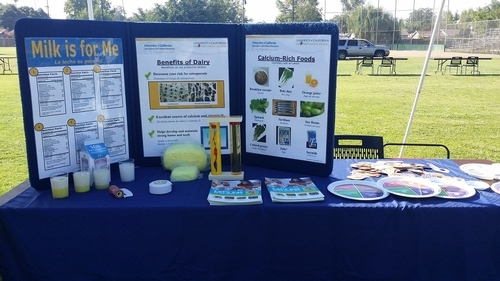 The UC CalFresh Nutrition Education Program joined in the event and set up their own booth to promote the importance of milk and calcium-rich food consumption. 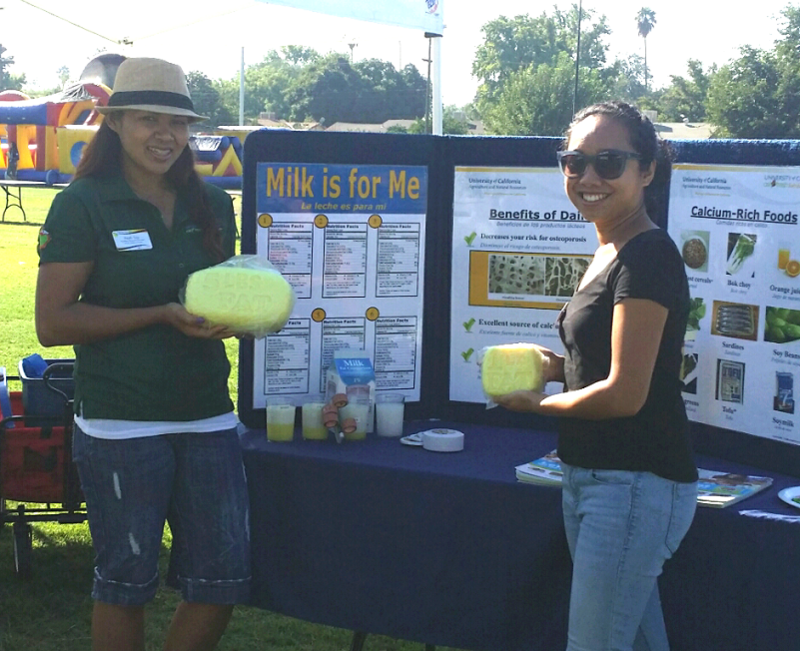 Nutrition Educator Nath Say (left) and Fresno State Dietetic Intern Mary Grace Hallare explain the benefits of dairy products and the importance of limiting fat. Different models of milk—whole to fat-free—were displayed to reveal their fat content along with other interesting hands-on visuals. Many parents were amazed to discover the amount of fat they were consuming on a daily basis. They were also surprised as they felt the actual weight of both one pound and five pounds of fat. Most importantly, they learned the pivotal role of calcium in bone health. 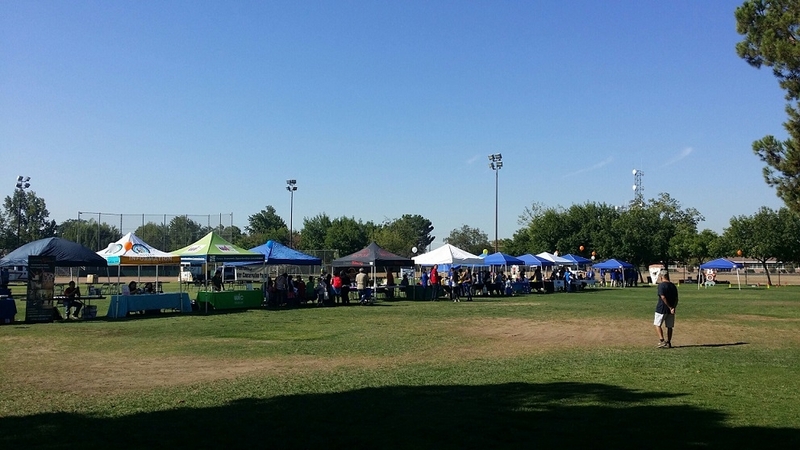 We would like to extend a special thank you to Parks and Recreation, the City of Fresno, Fresno Unified School District, and PG&E for sponsoring yet another awesome community event for the city of Fresno!